How exactly do you pull off the '90s look? The '90s are back and everyone knows it. But how to jump in on the trend without looking like you've stepped back in time? Check out these tips and see how you can bring in the best of the decade. DO: Integrate one '90s element. 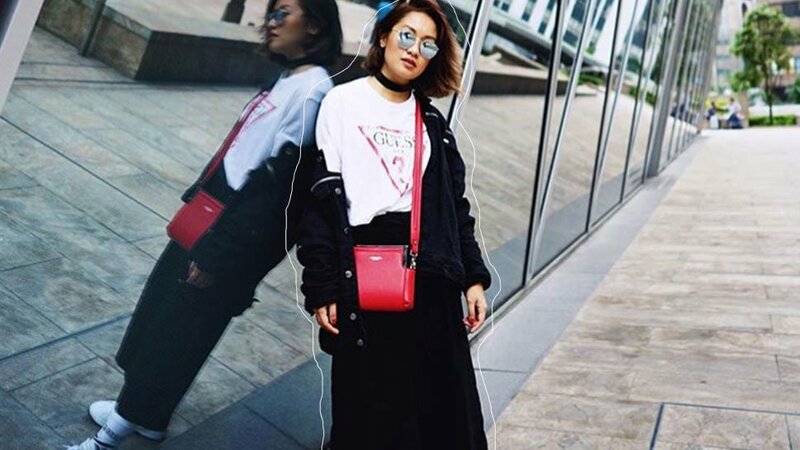 Akiko Abad shows off how she does throwback style by building her look around her GUESS logo tee. To keep the look current, she added in a bomber jacket and distressed denim culottes. DON'T: Dress in one time era. Sure, the '90s are back, but that doesn't mean you have to stay stuck in that decade's sartorial choices. Rather than dress head to toe in '90s references, stick to one iconic piece from the era and build your look around that. DO: Add a pop of color. Laureen Uy demonstrates how to turn a bit of color into a statement detail by injecting vibrancy into an otherwise black-and-white ensemble. DON'T: Forget about the power of color. Notice how the red elements on her shirt seem to call attention? Not only does her red crossbody bag pop against her dark outfit, it ties in with her outfit seamlessly, too. DO: Leave yourself a little "undone" on your more casual days. Issa Pressman shows us the value of au naturale by connecting it to the casual vibe of her look. Distressed denim and a relaxed beauty look is your new go-to for dressed down days! DON'T: Forget about your accessories. With a dressed-down look, the details matter. Notice how her hoop earrings and belt stand out? You can sport discreet accessories like Issa does, or use it as your vintage item as a backdrop of a more attention-grabbing piece. DO: Twin with your BFF. What's better than wearing your favorite vintage tee? Follow Verniece Enciso's cue and have a friend sport it alongside you in a matchy OOTD snap! DON'T: Forget to get her a matching tee. If you're looking for a timeless find that brings that vintage vibe, look no further than GUESS's array of logo tees. Grab your own logo tees by visiting any GUESS store nationwide.